I am enjoying the learning curve for a sideswiper, but find the commercial models a bit expensive. I am currently using a paddle. I would like to make a sideswiper from a ruler or hack saw blade. I looked through the files but could't find one. Could you direct me to a place or individuals that have made good ones. has a great many photos of cooties , some home-brew. You might pick up some ideas there. Forwarding Clifford's note below, nice video. Can anybody give him a hand with those recordings he is looking for? Please contact him direct and keep the group informed. Your website inspired me to build and use a sideswiper. I enjoy it a great deal. Would like to find recordings of various swings such as banana boat and lake erie. Again, TNX for great info on these important telegraph keys. Well done John, let's hope for better conditions next Sunday evening. Yesterday I received the enclosed email/photos from Paul ON4ADI after a 2XCootie qso the day before, at my request he was happy to let me share his creation on the SSN reflector, I was impressed with his sending considering only 5 days practice!! thank you for a super 2-way cootie qso yesterday. Afterwards, i had a look to your home-brew collection of sideswipers and they are very nice indeed. Now, about my ugly duckling ( see photographs). 5 days ago i started to build the thing and then had to learn how to use it. Its is nothing more then a hack saw blade ( 31 cm long ) end two contact-points, made out of nuts and bolts. There are 5 pieces of wood. Two of them are used to hold the saw blade in its place. They are a snug fit with the bottom pieces, so they stay put, once placed in the groove. The one in the middle can be moved back and forth ( system maniflex ) to alter the length to the contact-points and therefore also to change the tension in the blade. The second one, by which the blade is also held level and where it is attached to, can also be moved. 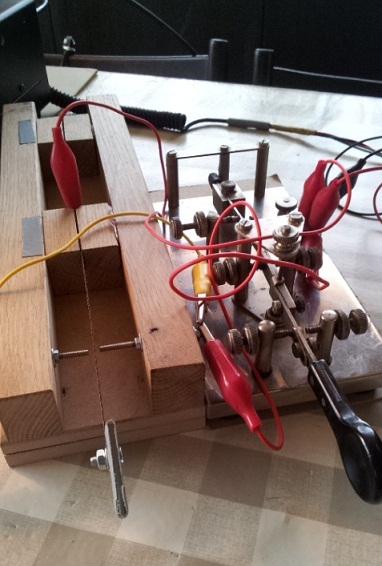 By doing so, it changes the lenght between de contact-points en de knob. This is something i can't find in any cootie on the net, but perhaps i have to look a bit harder. So Martin, i hope that you will like my explication and my woodie cootie although it never will be a speedy key. 73 Martin es thank you vy much for the fine qso. Pinocchio would be happy to call it his brother! When sending with a sideswiper, it pays dividends to concentrate on your spacing, length of dots and dashes and of course add I tell people: "Send the word spaces!" You can also hear recordings from Lands End Radio, Niton Radio, Wick Radio and others. The recording Irish Sea has the western stations and perhaps the Irish stations, EJM and EJK as well. I think Liverpool was gone but the call GLV was still used by Anglesby Radio. Portishead Radio of HF fame is also recorded. Check out "The Last Eastbound Trans Atlantic Voyage of Queen Mary/GBTT." Art also recorded 600m in Western Europe in the collection! Radio and landline Morse commercial and amateur. Please have a look at Steve's - W1SFR latest creation, the TBCP, Torsion Bar Cootie/Paddle Key. A compact design and very well finished key. Want to get one for yourself? Here you will get all info you might need. I follow propagation using WSPR. I have a 2-watt WSPR transmitter on 20 m, which transmits every half-hour. 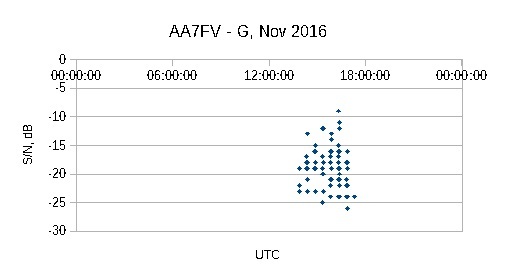 Here is a plot of ALL reception reports on this 2-watt transmitter over the last week, between AA7FV in Arizona and stations in the UK. The transmitter was operating 24 hours a day all week, but transmitting just for 2 minutes every half-hour. As you can see, in the last week there were NO reports outside a fairly narrow range of time between about 1400 UTC and 1700 UTC. This is nicely centered on the time of the International Sideswiper Net. I look forward to this Sunday's net! In case anyone's interested, here's a rather poor reproduction of the pattern of the main beam from my rhombic antenna, on 20 metres, superposed on a Great Circle map centred on AA7FV in southern Arizona. The half-power width of the beam is 18 degrees (+/- 9 degs), centred on northern England. The purple lines mark the -3 dB points of the antenna, and you can see that most of France is included. Unfortunately CN8, at a bearing of 55 degrees from AA7FV, is about at the -10 dB point of the beam, which makes the rhombic a little better than a dipole in that direction. There is a strong sidelobe at a bearing of about 75 degrees that's only about -6 dB down on the main beam, which is close to the bearing (72 degs) to Jean, 5T0JL. I wish I could rotate the antenna. 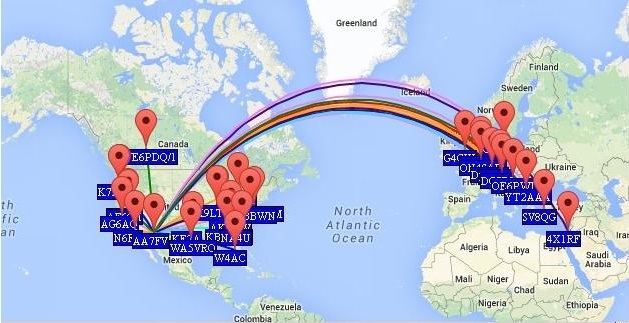 This image is taken from my QRZ page, and shows the reports I received using WSPR on 20 meters in an evening in March 2014, from four 2-minute transmissions. This was using my 2-watt dedicated WSPR transmitter. 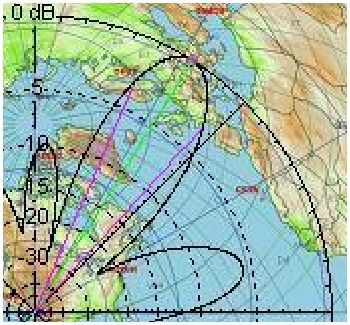 The line of stations from G4 to 4X follows closely the great circle bearing of the peak of the main beam of the rhombic, from southern Arizona. The major goal was to try to get good coverage into the UK from AA7FV in Arizona, to be able contact compromise stations in the UK who might have "a bit of wire out of the window" antennas. I'm also G3SYS, although I left the UK 40 years ago and that call rarely gets used these days. As you say, there is always a compromise. My original design for the rhombic had it slightly larger than it is now, but that put one of the poles supporting the wire into the middle of a dense cactus patch. That cactus was more than I wanted to deal with, so I compromised and sacrificed nearly 1 dB of gain by reducing the size of the antenna to avoid the cactus. Everything is a compromise. I made another plot of my WSPR reports in the UK for 20 metres, for the last week. My 2-watt WSPR tx was transmitting every half hour, day and night, except when I was using the antenna on CW. 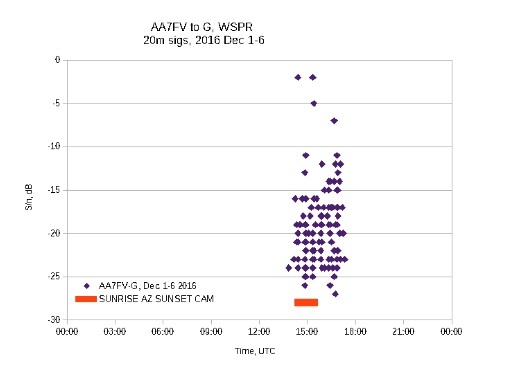 For reference, the red line shows the time between sunrise at AA7FV in Arizona, and sunset in Cambridge in the UK. I've plotted all reports received on the path to the UK, from Dec 1 to Dec 6. The plot below shows frequency on the vertical scale, but I've marked 14 MHz with the horizontal white line. The colour scale gives the relative signal level. The times of receiving reports on my signal agree very well indeed with the VOACAP predictions. As last week, the times of our international SSN net, 1500 and 1600 UTC, match very well. 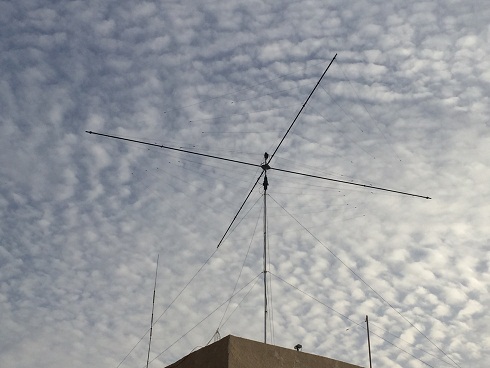 The signals on 17 metres should be better than 20 metres, and 21 MHz is predicted to be very marginal. 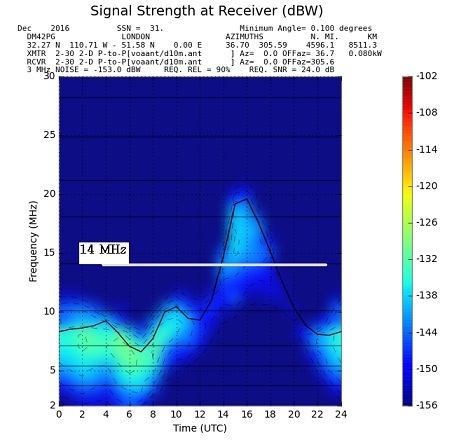 It will be interesting to see how well the ionosphere is behaving on Sunday.